Fires on Mount Agung Karangasem regency, Bali, since last Friday afternoon, until yesterday, about 600 hectares of forest on the slopes of Mount Agung, estimated burned. Joint officers attempted to extinguish a forest fire on Mount Agung, by using a helicopter. 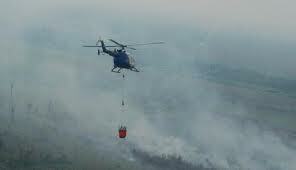 The helicopter finally used, after extinguishing the fire manually by hundreds of officers are not able to extinguish the fire with a maximum. Although it has been done on the last day on Saturday. Although some fires could be extinguished, but the other points difficult to extinguish, because difficult area, as well as the condition of the forest with a lot of wood and dried leaves. The hot weather and strong winds as a barrier to extinguish the fire. In addition to unfavorable weather conditions, difficult terrain traversed is also a barrier while fighting the fire. Fairly wide field of fire, and the fire quickly spread and mebakar forests, resulting in overwhelmed firefighters. Efforts to cut manual has not been too effective to inhibit the spread of fires. Too much energy is drained, but not get maximum results. Saturday afternoon yesterday, most of the officers in the back end down, while the fire helicopter was flown to speed up the process of extinction. The helicopter was previously only used to monitor forest fire on Mount Agung through the air. Air monitoring aims to clearly know where the hotspots and direction of spread. However, eventually the helicopter was used to maximize fire fighting.